M.A. Stewart Roofing, Inc. is a Cleveland, Ohio based roofing company and roofing contractor specializing in residential and commercial roofing. We have been repairing and installing roofs for homeowners and businesses since 1975. We offer a 10 year warranty on our workmanship. We provide roof installation, repair & replacement services for Cleveland, Ohio and Cleveland suburb homeowners and commercial building operators. We are experts at protecting homes and businesses from rain, snow and northeastern Ohio's weather. We look forward to talking with you about your roofing requirements. Our residential and commercial roofing services include re-roofing, roof tear-offs, ventialation system work, skylight installation, replacing roof decking, seamless gutters and downspouts, attic ventilation systems, blown In insulation, ice cables and roof inspection services. We are committed to using excellent roofing materials. 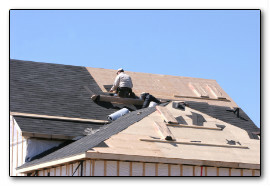 Our roofers are very experienced and are certified. Roofing materials that we use include wood shake, cement tile, copper, asphalt shingle and stone coated metal. We provide roofing contractor services for new home constrution and work with a number of Cleveland, Ohio's leading home builders including Miller Homes, Allan Homes and CDT Custom Homes. To request a free residential or commercial roofing estimate call 216-531-2687 or click here to contact us by email regaring your roofing needs. Copyright ©2019, M.A. Stewart Roofing, Inc.